I saw Alice In Wonderland with my family the other day. We've been waiting for this movie to come out since we saw the first trailer. My husband and I are big fans of Tim Burton and of course, Johnny Depp. As we were entering the theatre, we were surprised that no one was passing out 3d glasses which is the custom in Greenhills. So we sat down in our respective seats and thought, this is Shangri-La, they'll probably hand them to us personally before the movie begins. But they didn't. We bought tickets for 2d. Too bad since it seemed like it would look really good on 3D. The movie was very entertaining and I thought Helena Bonham Carter did a great job as the red queen. You also can't help but compare the movie to the life of modern revolutionary bohemians, but more of the dandy type. 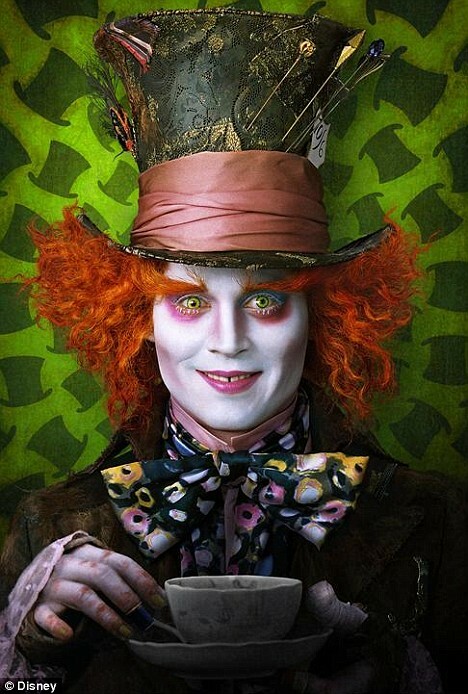 I found the madhatter's costume very interesting. The lace covered tophat was pretty, the scarf around his neck in a ribbon was gorgeous and i like the look of cropped pants with mismatched socks. Very quirky. I think I will be going as him this Halloween. This is a pic of me and my daughter at home after seeing the movie. She was scared for the most part of the flick but oddly enough, as most 3 year-olds are, she still keeps asking me to get her the dvd. Maybe the volume in the theatre was just too overwhelming for her.